How do you work through self-doubts and fear? I quiet my mind and tell the “fear” that it’s okay and I got this. Then I take ACTION. Just one little step gets me moving in the direction I desire. What makes you happiest? Snuggles with my sweet kids, Kate and Jack. Just having unconditional love surround our home just makes me feel whole. What book should everybody read just once? The Giving Tree by Shel Silverstein. Why do you write? Because I HAVE too. Telling my truth, writing what I believe in, it’s how I serve others. What do you hope your obituary will say about you? That I lived a life of ease and authentic love of life. How much sleep do you need to feel your best? I wish I could say 8 hours but 9 hours really changes my life! How often do you write? And when do you write? I try to write daily in my journal as well as for my books. Just getting a pen and doing a brain dump does wonders for my mood and also I feel I accomplished something each day. I write in the mornings after mediation. I try to get up at 5 am but it’s more like 6 am! 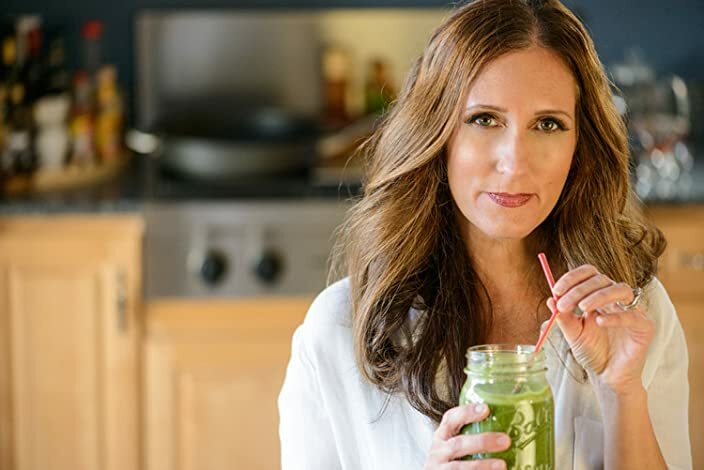 Win a FREE Renewal 10 Day Detox coaching package! Recorded Kick-Off call to get you prepared for your detox adventure. I go over Spring Renewal detox details so you can get started right away. Daily email check-ins and unlimited daily support. I will send you an email each day with a video. These daily videos will keep you motivated and inspired during the detox plus if you have a private question, you can email me anytime during the cleanse. You have my full coaching for 10 whole days, 24/7! Detox community support group. You'll have access to our exclusive private Face Book group which is on-going so you can start anytime and receive the support you need from a loving community. A complete 30 page Detox Manual. This manual is downloaded to your computer. Manual includes your step-by-step menu plan (daily breakfast, mid-morning snack, lunch, mid-afternoon snack, dinner spelled out for you), ALL-NEW spring recipes, pull-out shopping list, daily instructions, and FAQ's. Printer-friendly pdf! Daily Detox Journal so you can jot down your experiences during the cleanse. This journal pdf can be downloaded to your computer. Private Membership Area to grab important links to blog posts, videos, materials, and bonuses. All you need is one spot so no wasting time searching for emails, posts, and links. Detox Prep Guide. As soon as you sign up, you will receive a packet explaining how to prepare for your detox. Pre-cleansing instructions and daily detox practices are included. You'll also receive delicious pre-detox recipes so you can get a jump-start on your cleanse. That way on Day 1, you will be familiar with how things work and ready to rock Spring Renewal. Return to Life Instruction Packet. So what do you do after Day 10? This step by step system will help you slowly introduce eliminated foods like caffeine, sugar, etc… back into the diet without shocking your body. The personal post-detox worksheet is also included. This checklist will help you organize foods and practices that you will keep in your diet and life. Spring Recipe Cookbook with 25 smoothie, soup, and salad recipes for you to make after detox. These recipes are clean so you can ease back into "real life" allowing you to feel light and maintain your glow. You will receive this bonus on Day 10. EXTRA Menu Supplement Handbook. Receive 10 extra detox recipes added to the menu plan for Spring Renewal. You can use these during the cleanse OR for your "return to life after detox." WHAT DO YOU GET WITH YOUR DETOX KIT? Detox community support group. You’ll have access to our exclusive private Face Book group which is on-going so you can start anytime and receive the support you need from a loving community. A complete 30 page Detox Manual. This manual is downloaded to your computer. Manual includes your step-by-step menu plan (daily breakfast, mid-morning snack, lunch, mid-afternoon snack, dinner spelled out for you), ALL-NEW spring recipes, pull-out shopping list, daily instructions, and FAQ’s. Printer-friendly pdf! Detox Prep Guide. As soon as you sign up, you will receive a packet explaining how to prepare for your detox. Pre-cleansing instructions and daily detox practices are included. You’ll also receive delicious pre-detox recipes so you can get a jump-start on your cleanse. That way on Day 1, you will be familiar with how things work and ready to rock Spring Renewal. Spring Recipe Cookbook with 25 smoothie, soup, and salad recipes for you to make after detox. These recipes are clean so you can ease back into “real life” allowing you to feel light and maintain your glow. You will receive this bonus on Day 10.